I like to think that I take pretty good care of my skin. I get regular facials, I use sunscreen, and I have a specific at-home routine. But, when fellow AG Maryam Zamani invited me into The Cadogan Clinic on Sloane Street for a Visia Scan, I must admit, I was a tad nervous. Upon arriving at the Cadogan Clinic, a lovely nurse named Emma took my make-up off and explained to me how Visia machine works. 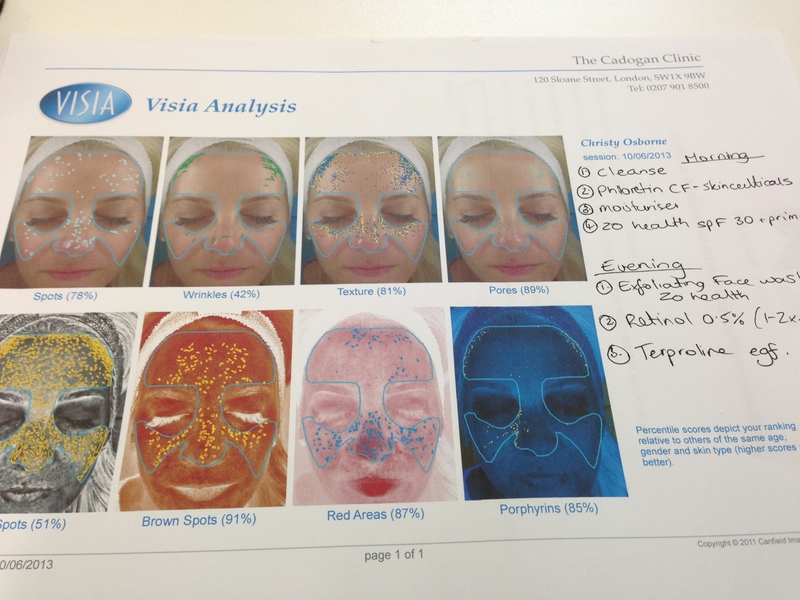 Visia does a complete analysis of your complexion to reveal whats going on beneath the surface. Basically, all those things that your trusted facialist can’t actually see. Visia then gives you a rating based on six different criteria- wrinkles (yikes!) spots, pores, skin tone variation, bacteria, and UV spots. I was terrified. Especially with regard to the UV situation, and my younger days of not using sunscreen on beach vacations. 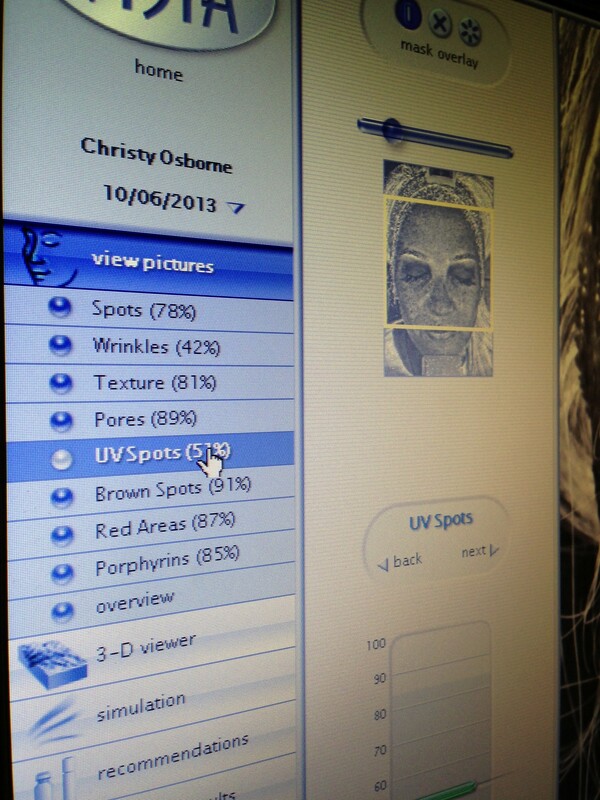 The Visia machine then gives you a “score” or percentage based on how you should rank compared to someone your age. I am delighted to say that my scores were OK… but that I clearly have work to do. 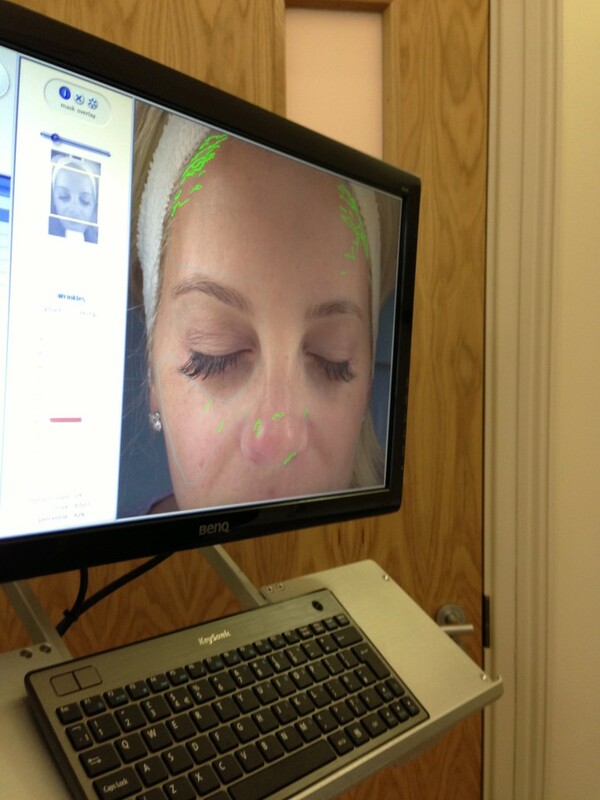 After my Visia scan I sat down with Dr Maryam Zamani. We instantly recognized each other from barrecore, and I felt comfortable with her going over all of my results with me. Maryam began her medical career in Washington DC as an American Board Certified Ophthalmologist, but upon moving to London, and after extensive training, added dermatology to her areas of expertise. She now does both surgical and non-surgical facial rejuvenation which includes everything from botox, fillers, eye-lid surgery, lasers, peels, and more. Based on my Visa “scorings” Maryam tweaked a few things in my skincare regime, including adding retinol, and ensured me that taking a few extra steps now would improve the whole aging process. I will not confirm or deny that I also did a little botox with Maryam ……she is FANTASTIC. Girls, if you’re going to go for a little ‘tox- Maryam is your gal. Her entire approach is about looking completely natural and not overdoing it. It didn’t hurt at all, and I doubt anyone noticed the change except for me. The Visia scan is free service at the Cadogan Clinic, but make sure you then book a consult with Maryam to discuss your results. The Cadogan Clinic is located at 120 Sloane Street. You can read more about Maryam Zamani on her own website here.